Sky Blue Trust release statement RE: Northampton Town groundshare. The Ricoh Arena, home of Coventry City since moving from Highfield Road in 2005. The Sky Blue Trust have this afternoon released a statement regarding Coventry City Football Club’s potential ground-share at Sixfields; the home of Northampton Town. The Sky Blue Trust opposes the proposed ground share with Northampton Town in the strongest possible terms. The Trust’s membership has indicated overwhelming support for the Board’s stance on this issue.We cannot see any justification for forcing loyal supporters to make a 70 miles round trip to watch their team. 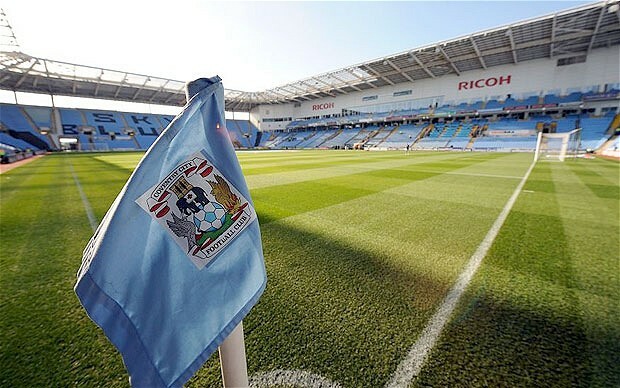 We have a state of the art home at the Ricoh, ACL have indicated that they are willing to let the club play there for cost whilst in administration and discuss further arrangements after that. Revenues will plummet over the years the club is at Northampton and the already dwindling support will become irreversibly damaged. Once fans stop going to matches it will be almost impossible to entice them back. This totally unnecessary move could well spell the end of Coventry City. The supporters have shown the club their opposition to any proposed move in their thousands, through the Trust’s members survey, the Coventry Telegraph’s petition and other online petitions, yet all these voices are being ignored and treated with contempt by Mr Fisher and Ms Seppala as they blindly plough ahead with this suicidal proposition. The Sky Blue Trust support the initiative “Not One Penny More – Keep Cov In Cov” and encourage them to continue to spread the message locally and nationally that Coventry fans want their club to be playing in Coventry, now and in the future. Pressure will continue to be made by the Trust to the FL to ensure they are fully aware of the fans feelings. The Trust is setting up an urgent meeting with their counterparts at Northampton Town with the intention of showing a united front to the owners of both clubs that we are all against this totally ill judged and unwelcome proposal. The Sky Blue Trust will be at the Godiva Festival at the weekend so if people want to join the Trust or make their feelings known to us, we’d welcome them to the Trust stand in the Family area. « Coventry City awarded bye in Johnstone’s Paint Trophy first round.